Summer is over and beaches are still not empty yet, instead of bikini babes sunbathing on the beach, you will see more surfers going for the waves. Even after work, the enthusiasts do not rive back home but towards the waves for some surfing actions to ease their itch! While photographing the surfers with my 70-200mm f2.8 on my 5D II, I can see more surfers coming into the beach as it gets a little over the office hour. Observing their excited faces as they rushed down to the beach for warm up, I can really feel their passion in surfing, as great as one’s hobby. I really had fun photographing the actions down, especially when I see some real cool swift actions while riding the waves. The waves were not somewhere more than 6 meters high, but it was already enough to see the surfers riding on it with some efforts. I can see that those surfers were intermediates and I have made few nice images out of them. They were approximately 300 meters away and with my 70-200mm f2.8, it was still not enough to reach them. Therefore, cropping was done with photoshop. For the first two pictures, I would like to share the shots that I took of the surfers while they assess the waves when entering the water with one of them hesitating seeing how strong the wave is. One more image portraying the surfer slowly making his way down into the water. The pictures below were cropped approximately 100% when taken at 200mm. Some surfers ride the waves easily without much efforts and some need more tries to get their boards riding the waves. I knew it seems much harder than it looks and I am glad to be at the bar beach in Newcastle, Australia, taking shots of the surfers. It was a short drive away from my hotel and I grabbed this chance to visit the beach before it gets dark. During this time of the year, sun sets earlier at around 5pm. 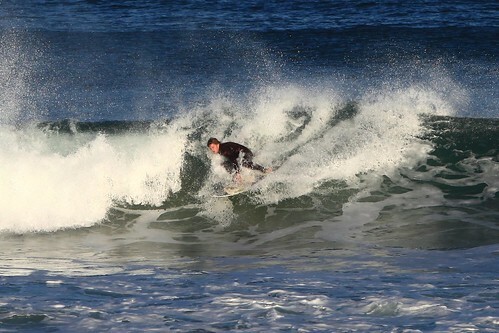 Great surfing pics Alex, I live at Redhead beach, approx. 20 min drive south of Newcastle. Newcastle is also the home of former four time world surfing champion Mark Richards. Oh wow! Ok.. Its too bad that I knew you late. Otherwise we can meet up! Ya, the surfers were good! And I enjoyed photographing the actions. Wonderful dynamic set of images. Thanks! The surfers were good too! Thank you! Glad that you like my photos! Yeah. they are really good! Thanks! Nice of you to drop by! Ya, 70-200mm is not enough. Yea! It was really awesome and surfers were everywhere bto catch the waves! So cool! the breaking waves really stand out against the ocean blue-ish tone. great contrast, and amazing shots! Thanks a lot! 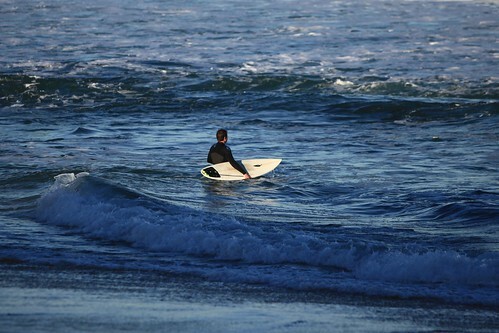 I love the surfers and the waves! Nice shots, reminded of me of when I surfed in Australia, wish I was still out there, not had any waves where I am for a weeks! Oh… Well, take a vacation elsewhere and surf! Thanks for commenting on my site, Alex. Thought I’d hop over and see what yours is all about. Great shots….this is how I surfed in Hawaii! Just kidding, I wish. Love your website name too! Thanks for dropping by! So nice of you! The Khoo in mykhoolife is my family name! Well, you can always do some simple surfs in Hawaii! Cheers! Wow, this is some different from out little surf beach here on the coast of Maine! Oh really? I have never been to Maine before. Your picture is amazing! For movement object, how fast is your shutter setting and F level? All of the pictures are sharp! Amazing! For these action shots, I would always use a very fast shutter to capture the movement from afar, For my case, my settings are f6.3 and 1/1600s shutter. Thanks for dropping by! Do feel free to follow my blog too! Thanks! It was a great experience for me! Loved all these surfing shots Alex, you really captured the energy of the magnificent waves as well as how they were carved by the surfers! Thank you for stopping by and giving this nice compliment! Thanks! Do feel free to follow my blog if you like! Perfectly captured! Man, those shots were really amazing! I love that shot when we has finally standing on his surf board. Perfect! Yea! I had a lot of chance to capture all the shots I want there! Thanks for your compliment! Feel free to follow my blog if you like! Great shots here!! Enjoying your blog! You’ve captured the action so well! Thank you~!! I’m sure you can too! Hey, I nominated you for the The Very Inspiring Blogger Award. but I know I am getting knowledge everyday by reading such nice content. Haha! Cheers! And thanks for the compliment!